This is a scarce and important map issued by the S.D.U.K. in 1833 depicting Lake Michigan, the second largest of the five Great Lakes, and the only one that lies entirely within the United States. Centered on Lake Michigan, it covers the surrounding region including the states of Michigan and Wisconsin. The map covers the Huron or Northwest Territory (modern day Wisconsin) and the Michigan Territory (modern day Michigan) along with parts of northern Illinois. The map depicts territories and counties in outline color. Lake Michigan is slightly malformed and distended on the vertical axis. 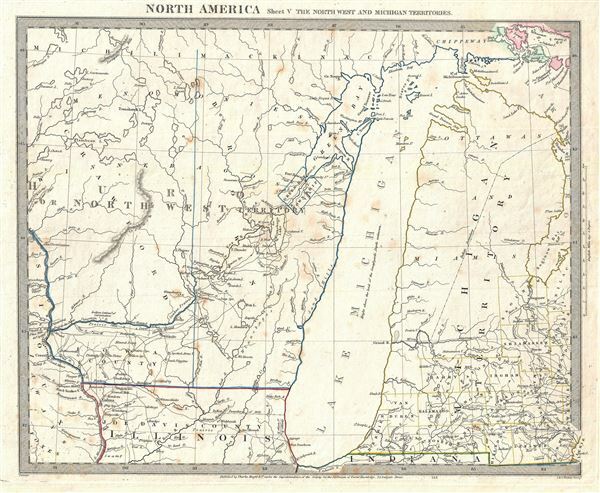 The map names several Indian tribes, including the Ottawa and the Chippeway. The Bad Axe River is also identified. It was near the mouth of the Bad Axe River that the Bad Axe Massacre or the Battle of Bad Axe was fought at the end of the Black Hawk War in 1832, one year before this map was issued. Published in 1833 by Charles Knight of 22 Ludgate Street for the Society for the Diffusion of Useful Knowledge, or S.D.U.K. Although the Society formally closed its doors in 1848, subsequent reissues of the S.D.U.K. atlas were printed well into the 1870s by Chapman and Hall, who acquired the original plates. Maps of the Society for the Diffusion of Useful Knowledge, (London: Charles Knight), 1833. Very good. Original platemark visible. Blank on verso. Minor spotting at places.